We photograph all sizes and media of 2D artwork and prepare files for printing. In order to obtain the best possible color match to your art, we need to have the original in our studio for photographing and printing of proofs. Please allow up to 5 working days for completion. 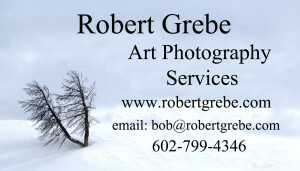 For each individual piece of artwork there is a one-time set-up charge of $35.00. This includes one proof print on 8.5″ X 11″ Epson Ultra-Premium Presentation Matte paper. This charge is only made after you approve the proof. We provide most digital file services, including file resizing and file-type conversion, color space conversion (ex: RGB to CMYK, etc. ), large file transmission via FTP, and saving to your flash drive. We can meet the requirements for all show/contest entry applications once we have an approved image file. Please call or email me with any questions you may have.